The national “See Something, Say Something™” campaign is a simple and effective program designed to raise public awareness of indicators of terrorism and terrorism-related crime, and to emphasize the importance of reporting suspicious activity to the proper local law enforcement authorities. The US Department of Homeland Security partnered with the University, Miami-Dade County, and the State of Florida to help expand the “If You See Something, Say Something™” campaign across the country. Miami-Dade County used homeland security funding to print campaign materials for the University. The Florida Department of Law Enforcement (FDLE) manages the state’s Fusion Center which coordinates the information it receives between the appropriate local, state and federal officials. 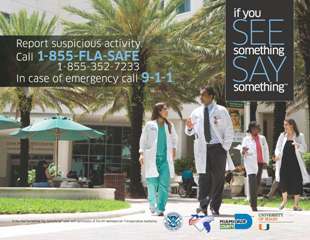 If you witness suspicious activity ON campus, call Medical Public Safety at 305-243-6000. If you witness suspicious activity OFF campus, call 1-855-FLA-SAFE (1-855-352-7233) or use the FDLE online form. Go to the Emergency Guide – Suspicious Activity Specific Action Guidelines for more info. Factors such as race, ethnicity, national origin, or religious affiliation alone are not suspicious. For that reason, the public should report only suspicious behavior and situations (e.g., an unattended backpack in a public place or someone trying to break into a restricted area) rather than beliefs, thoughts, ideas, expressions, associations, or speech unrelated to terrorism or other criminal activity. Only reports that document behavior reasonably indicative of criminal activity related to terrorism will be shared with partner agencies.